When our gardener moved on to bigger and better things after being with us for four years, we had to find a new gardener. The first one we got was a total bust. He lasted one day, got fired then threatened me with a lawsuit for discrimination. Apparently, it's discrimination to expect people to do good work? 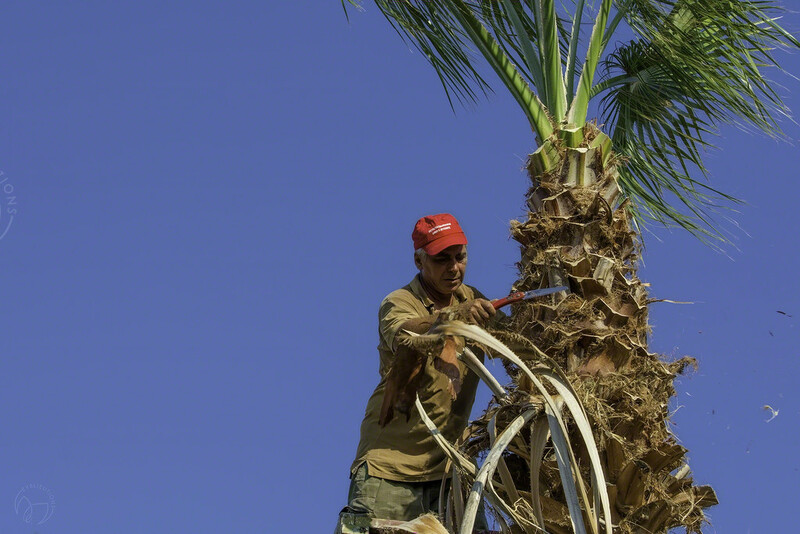 In any case, we did find an excellent company who started today with trimming all of the palm trees. This is an absolutely horrible and dangerous job. It hasn't been done to all of the trees all the way to the top since we have been here. This man started at about 7:20 a.m. This is his THIRD tree! He only used the folding knife. The younger lads used the chain saw. The tallest trees are about 35-40 feet tall...of course, I am terrible at guessing heights...so they may be taller or shorter. But, that man is about the same tall as me, (5'7"/170cm) and he is waaaaay at the top of the tree in a bucket truck! I am much better at guesstimating things in the millimeter range. I loved his concentration and was amazed at how he grabbed those palm fronds! Those things have spines on them that are wicked! He grabbed them and threw them around as if they were spaghetti! Great capture of man at work. Yes, hard work and difficult to find someone who takes pride in their work these days. We had palms that lined my street growing up. Nice capture. That is interesting to learn how that is done - pretty hard - and dangerous work with that height to deal with.